26 July 2016, at 6:00a.m. In his presentation during the 2016 Midwest Poultry Federation Convention in St Paul, Minnesota, Dr Carey* focused on what we have learned from the recent past and how to implement a biosecurity programme unique to each farm. He emphasised that biosecurity success or failure depends upon what happens when nobody is watching. If elements of the programme place unrealistic expectations on personnel or create undue logistical obstacles to day to day operations, then it won’t be long before the programme begins to break down. For example, site design factors, work flow and placement of cleaning and disinfecting stations must be individually tailored to each farm. If there are monitoring steps involved, there needs to be provision in terms of time and materials to accomplish the monitoring. The same is true with any cleaning and disinfecting steps. Many elements of a biosecurity programme take time to accomplish and we need to allocate this time into the daily work flow. Hurrying through a procedure because we are behind or we lack motivation to truly implement the steps necessary will compromise the programme in short order. Biosecurity programmes are best created by a team of individuals that represent a cross-section of all parties on the farm. You cannot sit in an office and draw up a plan that will work. Communication and frequent reviews and discussion of problems and breaks in the programme are necessary. All parties need to have an equal voice in the process. Those charged with health responsibilities will have an important perspective but those that work daily on the farm also have a very valuable perspective that must be included for the programme to be implemented and work on a sustained basis. Everyone must feel some ownership of the programme. It seems logical to assume that a biosecurity programme would be fairly easy to manage on a warm sunny day but a practical programme has to deal with various weather scenarios. Extreme cold may reduce the likelihood of a disease agent surviving on incoming traffic but the level of risk needs to be assessed and workable solutions need to be implemented. Another area often overlooked is the need for third party service providers (propane, electricity, etc.) to be on site. Again, when everything is operating normally this can be fairly simple but what kind of emphasis will be placed on biosecurity when the power is out in the midst of a storm? In addition to including a cross-section of all personnel in the development, implementation and modification of the plan, it is imperative that every person understand how their actions impact the biosecurity of the farm. Enforcement by fear of termination will not provide for a culture of compliance. Every person should be held accountable (regardless of position within the firm) and breaches need to be acknowledged and addressed. Biosecurity discussions should be a part of ongoing communications. Production meetings or other times when personnel are gathered to receive information is an opportunity to discuss (not preach) biosecurity. Listen to all input, ask questions, propose solutions and keep the programme fresh and viable. Maintaining open communication and addressing concerns and questions will help assure that the programme is operating appropriately even when nobody is watching. One element of a biosecurity programme that will almost certainly slip into neglect over time is collection of records. This is primarily keeping track of human and equipment traffic but also includes monitoring records for pest control and other environmental sampling. With regards to keeping track of human and equipment, traffic log books have been the mainstay for a long time. Generally, they become dirty, wet and faded over time and thus are not of much value in the face of an outbreak. Knowing who and what has been where and when are critical components of a disease response programme. There might be other surveillance technology that could record this information more easily and sustainably - keep this information readily available if needed. There is some good information that has come from case studies and other analyses of recent outbreaks. There were some factors that contributed to the spread of disease that are problematic to quickly remedy (wind for instance). However, there is overwhelming evidence that humans are implicated in a lot of cases. This should be a wakeup call for all of us. Letting our guard down even briefly can have devastating consequences. Review the information provided from these efforts and utilise this knowledge as you design and implement a programme for your farm. Much of this presentation has centred on the behaviour of people due to the lessons learned in the recent past. 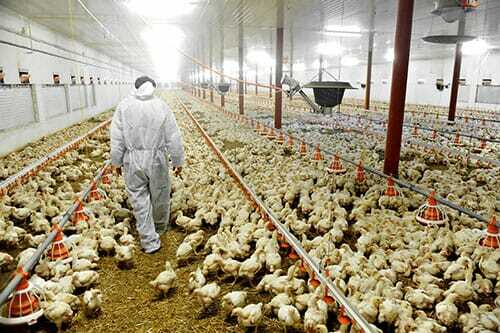 There are a multitude of potential threats that a biosecurity programme must address. All threats need to be addressed in a programme and the main five points apply to non-human as well as human threats. Some areas may require long-term modifications or adaptations to traffic patterns or barriers to movement. Others require knowledge of pest control and maintenance of farm grounds and structures. The key elements outlined above must be incorporated into all aspects of the biosecurity programme. Major components and elements may be similar across farms but the details are farm specific. Take any one of several model programmes and use it as a starting point for your programme. Once again, biosecurity is about WHAT HAPPENS WHEN NOBODY IS WATCHING. 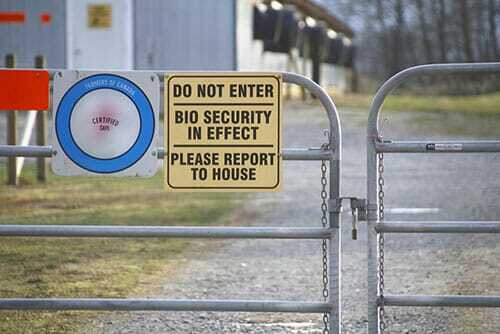 Your biosecurity programme has to make sense. It has to be workable for all parties involved. It has to deal with all circumstances. Everybody must understand their role and the importance of the programme. And we cannot neglect the fact that good records are important in dealing with an outbreak.